In the summer months while the CSA allocation is in full swing, I find myself perplexed at what to do with the tough and bitter beet greens that accompany the beets. This recipe does a great job of mixing in the greens without having their bitterness take over the dish, but providing a nice color and texture contrast to the dish. The goat cheese rounds out the meal with creamy balance to the wholesomeness of the farro and roasted beets. For a more substantial main dish I added in sous-vide chicken breast, but the recipe is delicious without for a side dish or a lighter main. As an added bonus, the leftovers are just as good on day two! Soak the farro in a large bowl and cover for an hour. Preheat the oven to 400 degrees F. Remove the beet greens from the beets, and rinse under cool water. Set aside. Peel the beets and dice into bite sized pieces. Toss with a tablespoon of olive oil and season with salt and pepper. Roast for 20-25 minutes, tossing once or twice. Test the beets for doneness by inserting a fork with minimal resistance. Remove from the oven and let cool. While the beets are roasting, remove the beet leaves from the stems. Bring 2 quarts water to a boil in a medium saucepan. Fill a bowl with ice water. When the water comes to a boil, add salt to taste and the greens. Blanch for two minutes, and transfer to the ice water. Allow to cool for a few minutes, then drain and squeeze out excess water. Chop coarsely and set aside. Bring the water back to a boil, and add the farro. Reduce the heat, cover and simmer 45 minutes, stirring occasionally. Remove from the heat and allow the grains to soak in the cooking water for 10 minutes, then drain. While the farro is cooking, make the dressing by combining all of the ingredients in a dressing shaker or mason jar. Shake until the ingredients emulsify. Toast the walnuts in a pan over medium heat for about 5 minutes, or until fragrant. Watch them closely as they can go from just perfect to charred in a matter of seconds. Remove from heat and place on a plate to stop the toasting process and coarsely chop once cooled. 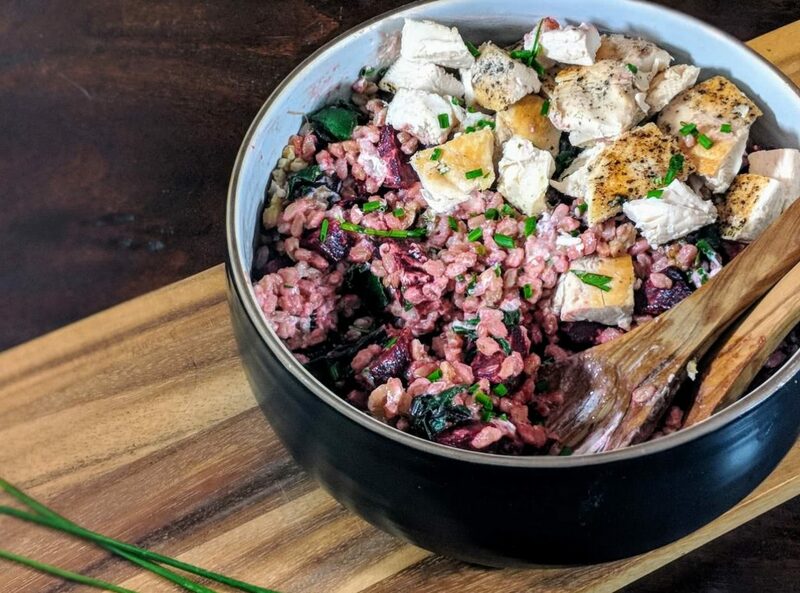 Combine the drained farro, warm beets, beet greens, walnuts, 3/4 of the dressing, herbs and the goat cheese in a serving bowl. Garnish with more goat cheese, if desired, and a sprinkling of herbs. Taste for seasoning and add additional dressing and salt and pepper if needed. If using chicken breast, top each serving individually and reserve any leftover chicken in a separate container.